Whilst talking to Shun in Takayama, I asked her where she had just come from; Kanazawa, it turned out. That was odd, I remember thinking. We had just had a massive conversation about Kanazawa, and all her highlights essentially revolved around her accommodation. By some bizarre coincidence, I had also booked Guest House Pongyi, buoyed by the almost universal praise on booking.com. So I bid farewell, promised to mention Shun's name when I checked in, and walked off wondering just how great this place could possibly be. This is going to be long, as I'm going to try and condense my three days in Kanazawa into one post. So strap in! I love this place. A refurbished 136 year old kimono shop, it was by far the most 'authentic' place I stayed in. Small (yet not cramped), the interior consisted of low tables, tatami mats, and folding screens, and it just felt so incredibly homely. When you arrive, Yuu helps you set up your bed. Every time someone new checked in, Yuu or Maru would run around and introduce them to all the other guests. There were constantly activities available (calligraphy! tea ceremonies! 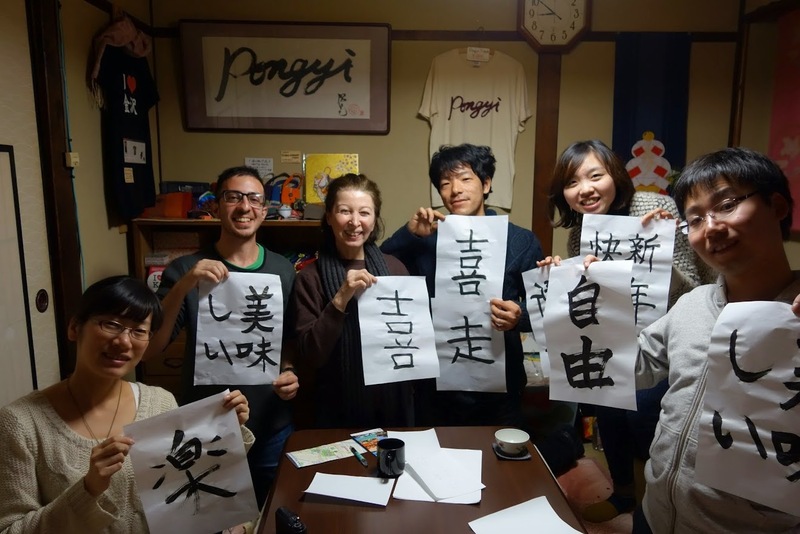 communal trips to the sentō (public bath)! Admittedly I took a pass on the last one). And at night, Maru would walk around and make hot water bottles for everyone! Seriously, it was more like a home-away-from-home than a hostel. Being so close to the sea of Japan, Kanazawa is known for it's seafood, and particularly it's shellfish. In fact, it seemed that I was there at the perfect time of year, as the ban on snow crab harvesting is lifted annually on November 6th, and the local Ōmichō-ichiba Markets near the center of town are flooded with row after row of bright orange snow crabs. For breakfast I had a cronut at Mister Donut (don't judge) outside Ōmichō-ichiba. Best damn cronut I've ever had. And I don't even like cronuts. Of course, I couldn't resist trying a crab dish at a local Izakaya that night. Served cold on top of a flame, this dish cooked itself! Another famous local dish is jibu-ni, a boiled duck and vegetable soup (the perfect winter dish). Duck, mushrooms, bamboo shoots, and lotus leaves, all simmered in a thick broth -- it was amazing. Perhaps it was my craving for duck talking, or the misery of the non-stop rain (more on that later), but oh god it was good. I was almost tempted to get two. For a while now, I had also started to slightly crave Italian, and on the recommendation of Catherine, a British university academic staying at the hostel -- followed the meandering network of canals connecting Kanazawa to the top floor of Kohrinbo 109 and to Saizeriya Ristorante and Caffe. Just looking up their website now, apparently it's a chain with over 900 locations across Japan - huh. I had no idea at the time. Regardless, it was well worth the 20 minute wait for a table, and the second I received the menu, I instantly discarded my plan for authentic Italian (I mean, I was heading to Italy in a month) and settled on the oddly tantalisingly-named 'doria'. Wait, why is it listed under 'Rice Dishes'? Sold primarily on the fact that it came with a soft boiled egg on top (I swear I'm not usually that shallow), I ordered and waited to see what strange food concoction would be delivered. And oh man. When I was actually in Italy, I still dreamt of that doria (in case you haven't been able to tell, I am slightly behind in updating my blog - but goddamn I'm going to try and finish it). Oh get to the point I hear you yell. Just tell us what a doria is already. Imagine the mutant offspring between a lightly roasted butter pilaf and a traditional Italian lasagne. And if that doesn't already sound amazing (you monster), have a look at the photo below. And before you judge me (isn't that just a lasagne with rice? ), I am not alone in revering this obscure Japanese-style Italian dish. Through diligent searching, I have found at least FOUR other anonymous internet citizens decrying the lack of doria in the wider western world. At this point I'm going to have to admit I've lied to you - I've become too emotional remembering the glory that was my first taste of doria, that I'll continue talking about Kanazawa (with more focus on the city than the food, I promise) in the next post. Meanwhile, I'm going to do a little bit of late night googling.